The players: Charlies Jones of C3 Presents; Daley nephew Mark Vanecko; Park District Superintendent Michael Kelly; Ari and Rahm Emanuel. The new contract that will keep Lollapalooza in Grant Park through 2021 will yield more money for city, county and state governments. But city officials blew the opportunity to eliminate other unfair advantages that the Daley administration gave the politically connected concert in its original sweetheart deal, and to correct problems these create for the city’s permanent music scene. The Park District secured an extra $1.35 million a year from the festival, which previously benefited from an unprecedented tax-free deal negotiated by its attorney and lobbyist, Mark Vanecko, a nephew of then-Mayor Richard Daley. But it will continue to give the giant concert an exclusive lock on Grant Park, prohibiting similar events by other promoters in the city’s biggest public space. It failed to weigh the negative impacts on the Chicago music scene against the profits the festival brings to local hotels and restaurants; it solicited no public input from the music community and did not consult the City Council; it did nothing to address controversial radius clauses that are the most restrictive in the music industry, and it did not set any penalities if Lollapalooza fails to live up to its obligations. How this applies to Lollapalooza is unclear, since it already had an agreement with the city, and no other bids were solicited or considered for such a concert. 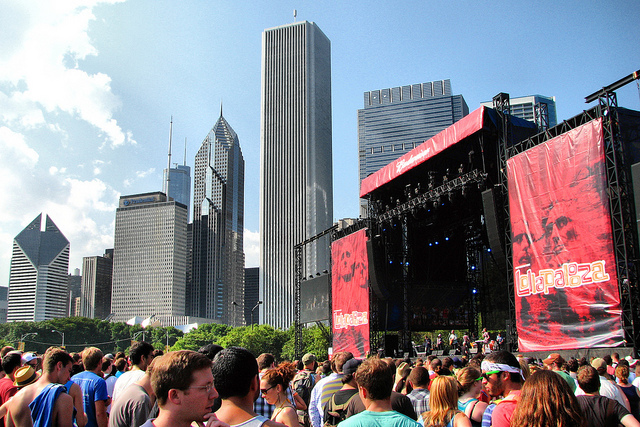 Seven years after its arrival in Chicago, Lollapalooza has been subject to increased scrutiny in recent months from elected officials at the city, county and state levels, as well as from the city’s inspector general and the media, all of whom questioned the concert’s unique tax exemption in the midst of the current budget crisis. But exactly who in city government demanded the new deal? Seven months ago, Emanuel appointed Park District veteran Kelly to replace the Daley administration’s last superintendent, Tim Mitchell, who oversaw negotiations for the first Lollapalooza contract. Apparently, one of King’s first actions was to put the Lollapalooza deal back on the table, though it is unclear if this was at the request of Emanuel. Later in the campaign and after his election, Emanuel repeated that promise directly to several other media organizations, including the Chicago Tribune, the Chicago Sun-Times and Time Out Chicago. “The Chicago Park District managed all negotiations regarding Lollapalooza, and the mayor was not involved in these discussions in any way,” Emanuel spokeswoman Tarrah Cooper said. But can the Park District superintendent or any member of his staff really qualify as the “independent, outside negotiator” that the mayor promised when the mayor has the power to hire and fire these officials? Al Gini, Professor of Business Ethics at Loyola University Chicago’s School of Business Administration, said no. While the new contract has not yet been made available for public scrutiny, some of the questions this reporter first posed to the Park District about it on March 23 finally have been answered, and a picture of what it does and does not address is beginning to emerge. Under the original contract the Daley Park District first approved in 2005—and later amended in 2008 to extend through 2017—a unique arrangement was set up whereby Lollapalooza partnered with the non-profit Parkways Foundation, which applied for all of the concert’s permits and licenses in return for a large annual payment designated for parks improvements. Last year, that payment was $2.7 million from gross ticket sales of $22.5 million. Daley administration officials claimed that Lollapalooza’s partnership with Parkways allowed an exemption from the city and county amusement taxes paid by every other entertainment event that draws more than 750 people—even though municipal law clearly states that promoters are liable for these taxes unless 100 percent of their profits go to charity. Lollapalooza also dodged paying the state liquor tax, since Parkways applied for the liquor license, despite the fact that alcohol sales at Lollapalooza actually are handled by a business partner of C3 and a client of Vanecko with numerous underage drinking convictions on his record. 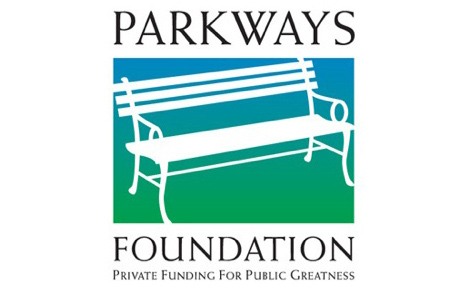 Founded in 1994 and a favorite cause of the late Maggie Daley, Parkways raised $520,000 for park improvements in 2003 and $525,000 in 2004, the two years before Lollapalooza was reinvented as a destination festival based in Grant Park. As its partnership with Lollapalooza progressed, 45 percent of the funds Parkways raised came from the festival. Total revenues were $5.4 million in 2009, the last year it filed its annual financial report with the state attorney general. The new contract takes Parkways out of the equation and requires Lollapalooza to pay all of its taxes. Underscoring that since 2005 it essentially had become an adjunct of the concert, Parkways announced on March 30 that it will cease operations. Since 2010, it had lost 10 of its board members and executive director Brenda Palm, who saw her salary jump from $62,000 to more than $109,000 a year after Parkways began working with Lollapalooza. The festival undeniably provides a boon to some local businesses, especially restaurants and hotels. But it also undeniably hurts dozens of smaller music venues and concert promoters who comprise the city’s musical infrastructure 365 days a year, as opposed to the three days that Lollapalooza occupies Grant Park. Any serious consideration of Lollapalooza’s economic impact must weigh the positives as well as the negatives, economics experts say. Yet the Park District did not weigh any negative impacts on Chicago. What did it consider? “Projections on Lollapalooza’s impact to the local economy were derived from a number of sources including Crain’s Chicago Business reports, AngelouEconomics and anecdotal information from various local hotels and restaurants,” Maxey-Faulkner said. Published last August under the headline “Lollapalooza vies with Chicago’s top conventions in spending impact,” the Crain’s report was an embarrassing epic of unabashed boosterism that did not entertain the possibility of any negative impacts from the concert. Maxey-Faulkner offered no specifics on how hotels and restaurants provided their “anecdotal information.” Despite published reports in which local venue owners and promoters have said that Lollapalooza has hurt their business, the Park District received no complaints directly, Maxey-Faulkner said. It did not reach out to any of these Chicago music-scene mainstays, or publicize the fact that the contract was being reconsidered, which might have triggered Lollapalooza’s critics speaking out. Nevertheless, “We take very serious the feedback that we receive from our patrons,” Maxey-Faulkner said. The spokeswoman failed to address further questions about AngelouEconomics or respond to a request for any information it provided to the Park District. Based in C3’s hometown of Austin, Angelou describes itself on its Web site as “a technology firm [that] advises those companies and communities wanting to take advantage of the new economy.” In 2009, the company was hired by C3 to tout the economic benefits of its Austin City Limits Festival. Although the ensuing 15-page report is labeled an economic impact study, it does not mention a single negative impact on the local Texas economy from Lollapalooza’s sister fest. Nor did an earlier study that Angelou did for the South by Southwest Music Festival consider negative impacts from that event, even though Austin residents are becoming increasingly frustrated with the way it overwhelms the existing music scene and marginalizes local musicians there. In addition to dominating the city’s summer concert scene by its sheer scope and size—last year, Lollapalooza drew a record 270,000 attendees to hear its 130 bands—the festival wields unequaled power over the Chicago music scene via the radius clauses it places on all of those the acts that play on its stages. These prohibit artists from performing for six months before the festival and three months after it anywhere within 300 miles of Grant Park, which includes concert markets as far away as Milwaukee, Madison, Iowa City, Detroit and Indianapolis. C3 Presents has defended the radius clauses as standard practice in the concert industry, and it claims it waives them for any acts that ask. As the Sun-Times noted, several of this year’s headliners, including the Red Hot Chili Peppers and the Black Keys, will have played elsewhere in Chicago shortly before appearing in Grant Park. But in 2008, this reporter compared the summer schedules for 10 permanent venues that book the same sorts of acts as Lollapalooza for two years before the festival arrived and two years after, and the Chicago venues averaged a dozen fewer shows a year. That’s 120 nights with less music, less income for local businesses and fewer paydays for thousands of bartenders, club staffers, sound technicians and musicians. By way of comparison, the radius clauses imposed by the Pitchfork Music Festival, Coachella and Bonnaroo all are measured in weeks, not months. And last year’s Dave Matthews Band Caravan, a joint production of national concert promoters Live Nation and Chicago-based Jam Productions, imposed no radius clauses whatsoever. Requiring the artists it books to ask permission to perform in Chicago for three-quarters of the year puts C3 in the position of the Mafia Boss who demands that his soldiers—Chicago’s permanent venues and local and touring artists in this analogy—kiss the ring before setting out to do anything on their own, even if his answer usually will be yes. Why haven’t local venue owners and promoters made more noise about Lollapalooza’s heavy-handed practices? As noted earlier, many have lost a dozen shows or more each summer. Openly criticizing the festival only assures that C3 Presents will not dole out one of its handful of partnered after-shows to that venue, which means even more lost business. Then, too, there are C3’s political connections, and the longstanding danger in Chicago of angering the powers-that-be, which easily can dispatch an army of city inspectors to cite a long list of problems at a venue real or imagined. But some in clubland certainly have spoken out in public, and many more offer a litany of harsh criticisms in private or off the record. And they are not the only ones who’ve questioned the way Lollapalooza is doing business. Did the Park District even consider raising the issue of the radius clauses as the Lollapalooza contract was renegotiated? “The radius clause was not a part of the revised deal,” Maxey-Faulkner said. Are issues like the radius clauses and Lollapalooza’s impact on the local music scene valid considerations in a Capitalist economy of survival of the fittest? If the competition strictly is between private businesses, perhaps not. But Lollapalooza is a unique public-private partnership between two giant corporations and Chicago government. City officials should be concerned about the impact to the local music scene because that is part of their constituency, especially at a point when they’re preparing to laud its health in the much-ballyhooed Chicago Cultural Plan 2012. What’s more, the question of whether a similar concert in Grant Park would provide even more income for the city as well as more cooperation with and consideration of local music businesses never will be answered. After decades of severely limiting for-profit concerts in Grant Park or rejecting them outright, the Daley administration welcomed Lollapalooza with open arms when its owners approached them through a group that eventually included the mayor’s nephew. There was no request for proposals or solicitation of bids for such a festival, and the original contract explicitly prohibited similar concerts from taking place in Grant Park through the duration of the Lollapalooza deal, with the exception of city-run events such as Taste of Chicago. That provision remains intact in the new deal. “The clause was unchanged,” Maxey-Faulkner said. This means that even now, with a new administration more open to private, for-profit concerts in public spaces, if a festival like Pitchfork or the Dave Matthews Band Caravan wanted to move into Grant Park and give the city a better deal, it couldn’t. However, every other festival in a city park faces a stiff fine if clean-up and repairs to that public space are not completed within a specified time. 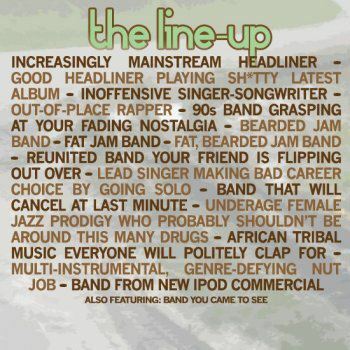 This holds true for events ranging from parish carnivals to the Pitchfork Music Festival and the Old Town School of Folk Music’s Folk and Roots Festival. The fines can be steep: Millennium Park charges promoters $5,000 for every four hours past the time set for the park to be returned to its pre-show state. 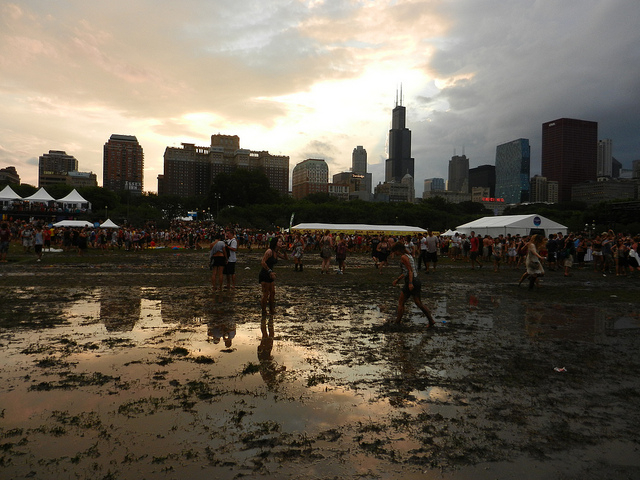 Under those strict provisions, Lollapalooza would have owed the city more than $1 million in penalties for last year’s delayed restoration of Grant Park. The city’s new contract with Lollapalooza does not set any fines or penalties for missed deadlines in restoring the park after the August concert, even if those repairs linger past the first frost. 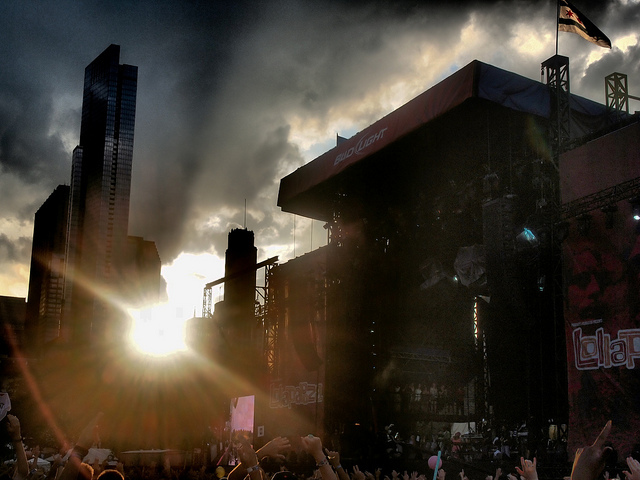 The city has taken on that burden instead, albeit on Lollapalooza’s dime. Despite the public relations hype, corporations by their very nature place self-interest and the bottom line before being a good neighbor; this is true of Apple, and it’s true of BP. Setting aside its origins as a celebration of the alternative universe and its current green initiatives, Lollapalooza is no different. City officials were entrusted with considering the festival’s relations with and impact on the community in exchange for granting it a privilieged and unique position here worth more than $22 million a year. Just as they demanded certain policies and concessions from Walmart and Boeing, they needed to assure that Lollapalooza does its part to be a good corporate citizen and considerate neighbor. In the end, the sweetheart deal the Daley administration gave Lollapalooza has gotten a little less sweet. But it’s still a lot sweeter than the deal any other musical entity gets from city government, and the Emanuel administration botched the opportunity to rectify that and level the playing field.